I am with my ‘MY ENVY BOX’ October edition. It’s a cute Golden box this time. 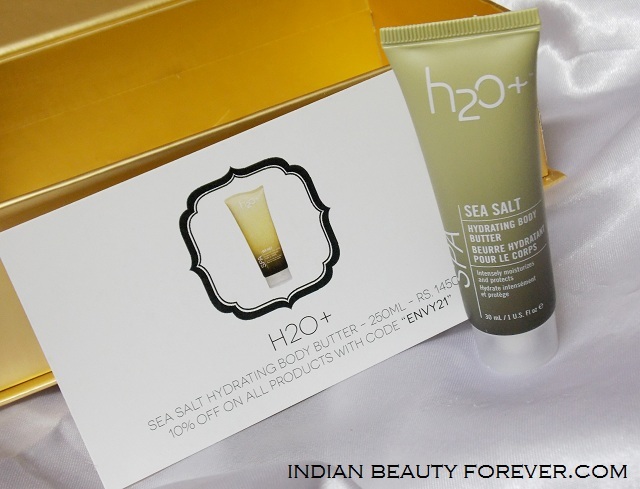 Do you know, it’s their anniversary box that has been curated by Vogue India? Exciting huh!! Those of you, who aren’t aware about them as of yet, Let me tell, My Envy Box is a luxury beauty sample box service where in you can get 5 samples from luxury beauty brands. By the way, that’s not it, the happiness and anticipation when you unwrap the products is always there as an added bonus for you. 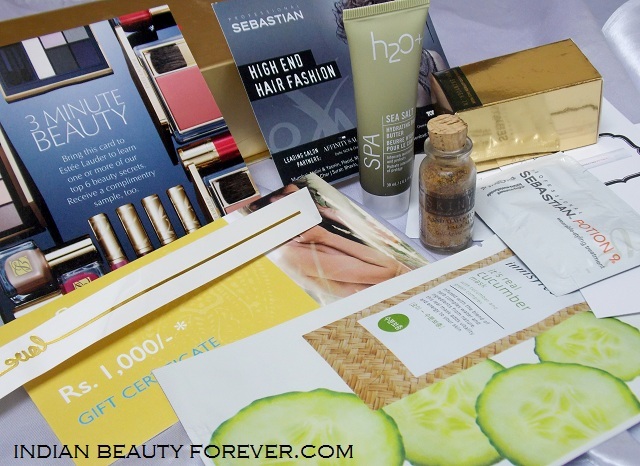 This month I got 5 products and some vouchers. I like face masks and after using this brand’s foot scrub, I will surely use it. It costs 1395 rupees for 50 grams. 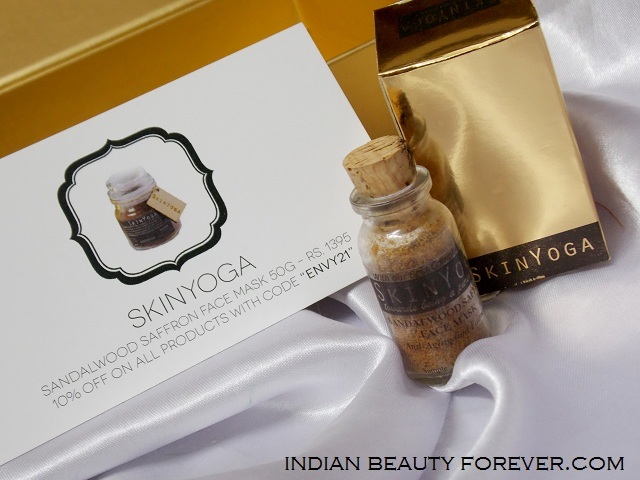 The goodness of sandalwood reverses the signs of aging and gradually remove wrinkles and dark spots. Saffron improves skin texture. It costs rupees 1450 for 250 ml. It’s a super intensive moisture cream to deeply nourish and restore dry skin. Shea butter and coconut oil deeply penetrate the skin to soothe, soften and hydrate. The sample sized bottle is a decent 30 ml tube. The serum is a product of extensive research of years. The serum re ignites the youthfulness in the skin. The multi benefit formula with revolutionary chronolux CB technology dramatically reduces the visible signs of aging. It costs 3200 Rupees for 30ml. the box contains 2 sachets of this serum as samples. This ultimate styling cream infused with nine botanical extracts to help restore lost moisture and rejuvenate the healthy look of your hair. 150 ml costs 1450 rupees and this sachet will last for 2-3 times. I like styling products therefore, if it suits me, I am all set to get the full sized one. The mask sheet is for 100 rupees and is very easy to use. 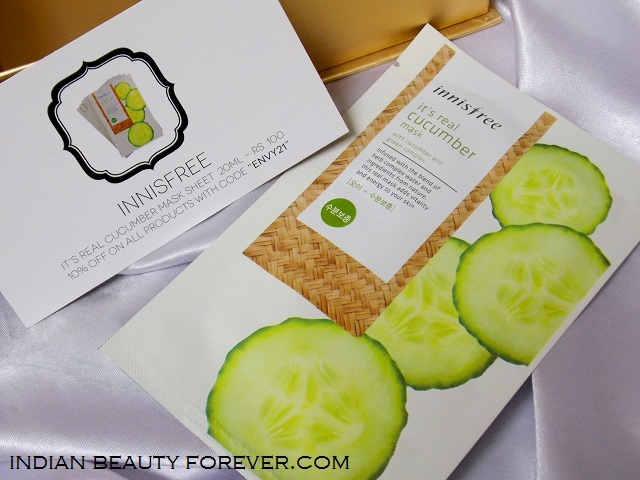 The rich in cucumber extract, this mask sheet gives significant moisturizing effect of blocking water and purifying the skin, so that the skin becomes moist and glossy. Now, this is something I really wanna try. So, these were the samples and now some vouchers and extra stuff. These are the tattoos created by Annelise Toraille. I got a pretty gold 'love' tattoo that I will rather give to my cousin as I am not a fan of tattoos, not even the temporary ones but some of you will really like it. Estee Lauder Free sample voucher that will entitle you to get a free sample from the counters till the stock lasts. 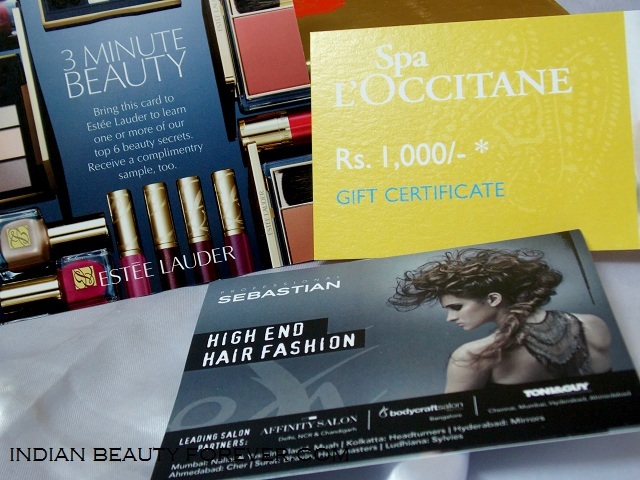 L’Occitane Spa 1000 rupees gift voucher that can be redeemed for facials and body treatments at L'Occitane spas. 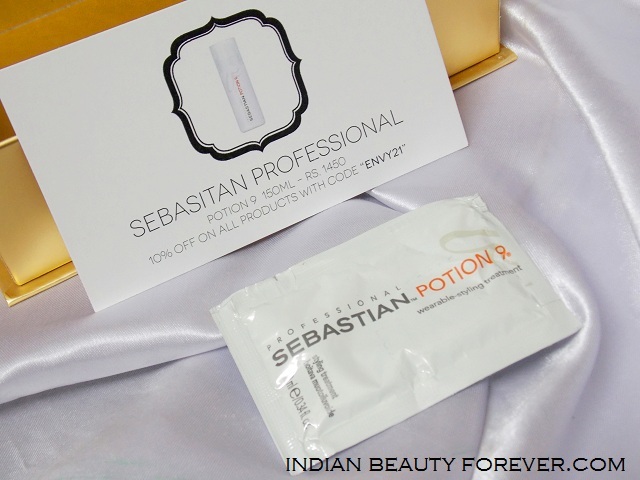 Overall, this month’s box was good as it has some of the products that I would love to buy in full sizes like the Sebastian professional Potion 9, Innisfree Cucumber mask sheet, if they suit me. 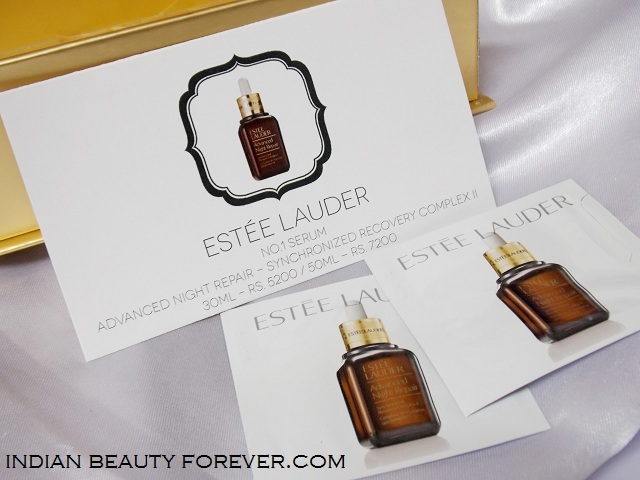 And even the Estee Lauder night serum since my skin behaves nicely with serums as opposed with the creams. I will definitely recommend you to try My Envy Box and get a dose of happiness for yourself at your doorsteps every month.